The Republic of Finland is a Nordic country situated in Northern Europe. It borders the Scandinavian Peninsula with Sweden to the west, Russia to the east and Norway to the north while Estonia lies to its south. Finland is bounded by the Baltic Sea with the Gulf of Finland to the south and the Gulf of Bothnia to the west. The Åland Islands, off the south-western coast, are an autonomous, demilitarized administrative province of Finland. Finland was previously part of the Swedish kingdom and later an autonomous Duchy in the Russian Empire, until it declared its independence on December 6, 1917. It is now a democratic republic with a semi-presidential system and parliament. This country of 5.28 million is a member state of the European Union and the United Nations. Along with Estonian, Hungarian and Maltese, Finnish is one of the few official languages of the European Union that is not of Indo-European origin. The name Suomi has uncertain origins but a strong candidate for a cognate is the Baltic word zeme meaning "ground, earth, country." The Archipelago Sea, between the Gulf of Bothnia and the Gulf of Finland, is the largest archipelago in the world by the number of islands. Estimates vary between 20,000 and 50,000 islands. The Wolverine, generally only found in Lapland, is an iconic Finnish predator. Finland is a country of thousands of lakes and islands; 187,888 lakes (larger than 5,382 square feet or 500 m²) and 179,584 islands. One of these lakes, Saimaa, is the fifth largest in Europe. The Finnish landscape is mostly flat with few hills and its highest point, the Halti at 4,357 feet (1,328 meters), is found in the extreme north of Lapland at the border between Finland and Norway. Taiga covers 75 percent of land area with coniferous forests, fens, and little arable land. Granite is ubiquitous throughout Finland, visible wherever there is no soil cover. Moraine or till is the most common type of soil, with a thin layer of humus of biological origin. Finland has a diverse array of flora and fauna, ranging throughout the various climatic zones. There are over 1,200 species of vascular plant, 800 bryophytes, and 1,000 lichen species in Finland, with flora being richest in the southern mainland and Åland Islands. Finland has a relatively new ecology given that many plant species, such as the Scots Pine, spruce, birch, and oak, spread throughout Finland from Norway and only reached the western coast less than three millennia ago. Similarly, Finland has a diverse range of fauna that arrived about 10,000 years ago, following the last retreat of the glaciers and re-appearance of vegetation. There are at least 60 native mammals, 248 breeding birds, over 70 fish and 11 reptile and frog species present today, many migrating from neighboring countries thousands of years ago. The Saimaa Ringed Seal, one of only three lake seal species in the world, has become the emblem of the Finnish Association for Nature Conservation and through dedicated work by conservationists this unusual seal been saved from extinction. Due to hunting and a history of efforts to control predators, many animals including the Golden Eagle, Brown Bear, and Eurasian Lynx, experienced significant declines in population. However, as a result of careful conservation and the establishment of vast national parks, among other measures, numbers have increased dramatically in recent years. The climate in Southern Finland is a northern temperate climate. In Northern Finland, particularly in the Province of Lapland, a subarctic climate dominates, characterized by cold, occasionally severe, winters and relatively warm summers. The main factor influencing Finland's climate is the country's geographical position between the 60th and 70th northern parallels in the Eurasian continent's coastal zone, which shows characteristics of both a maritime and a continental climate, depending on the direction of air flow. Finland is near enough to the Gulf Stream in the Atlantic Ocean to explain the unusually warm climate, considering the absolute latitude. A quarter of Finland's territory lies above the Arctic Circle, and as a consequence the midnight sun can be experienced—for an increasing number of days the farther north one goes. At Finland's northernmost point, the sun does not set for 73 consecutive days during summer, and does not rise at all for 51 days in winter. 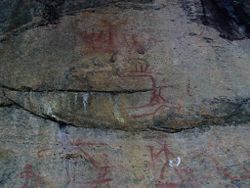 Prehistoric paintings in Astuvansalmi in Ristiina, the Southern Savonia region. According to archaeological evidence, the area that is Finland was settled around 8500 B.C.E. during the Stone Age as the ice shield of the last ice age receded. The earliest people were probably hunter-gatherers, living primarily off what the tundra and sea could offer. Pottery is known from around the 5300 B.C.E.. Scientists believe it is probable that speakers of the Finno-Ugric language arrived in the area during the Stone Age, and were possibly even among the first Mesolithic settlers in Europe. The arrival of the Cord-Ceramic Culture in southern coastal Finland around 3200 B.C.E. may have coincided with the start of agriculture. However, the earliest certain records of agriculture are from the late third millennium B.C.E.. Hunting and fishing continued to be important parts of the subsistence economy, especially in the northern and eastern parts of the country. The Bronze Age (1500–500 B.C.E.) and Iron Age (500 B.C.E.–1200 C.E.) were characterized by extensive contacts with other cultures in the Fennoscandian and the Baltic region. First written documents appear in the twelfth century. Olavinlinna (the medieval Saint Olaf's Castle) in Savonlinna, the venue for the annual Savonlinna Opera Festival. Built in 1475. 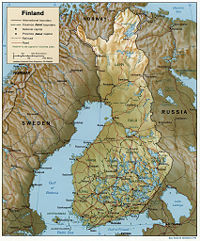 Finland's history since 1100 has been characterized by its relationships with Sweden to the west and Russia to the east. The beginning of Finland's over 600-year association with the Kingdom of Sweden traditionally dates from the year 1155  and the probable introduction of Christianity by Sweden's King Erik IX after a military expedition known as the First Swedish Crusade. The historically verifiable date of conquest is 1249 when Birger jarl conducted the Second Swedish Crusade to Finland. Swedish became the dominant language of administration and education; Finnish became a language for the peasantry, clergy and local courts in predominantly Finnish-speaking areas. The society was divided in four estates of the realm: nobility, clergy, burghers and peasants, who represented the majority, and the estateless. In the sixteenth century the first written works were published in Finnish by Mikael Agricola, and during this time, the Swedish empire (i.e., Sweden and Finland) converted to Lutheranism, the current mainstream religion. The Swedish kingdom settled areas and built the cities of Ingria and Kainuu. Governor General Per Brahe the Younger founded ten cities and the first university in Finland, the The Royal Academy of Turku. The establishment of universal literacy and rule of law also dates to this time. Finnish people participated in wars of the Swedish kingdom, and Finnish warriors of Sweden's army became known as Hakkapeliittas. Sweden pursued eastward expansion, only to be engaged by a recently unified Russia. During the eighteenth century, Russia expanded into Finnish territory and occupied large areas of the country. Sweden and Russia struggled to gain control of the area that by then was known as Finland. Under Swedish occupation, Finns maintained traditional freedoms; Russia sought to impose the more oppressed life of the Russian peasants on the areas of Finland it controlled. In the 1809 Finnish War, Russia gained the remaining Finnish territory from Sweden. Finland became an Autonomous Gran Duchy of the Russian Empire, which it remained until 1917. The Russian court officially recognized the language and national identity of the Finns, in an attempt to lessen the Swedish influence, which contributed to a growing nationalist sentiment, the Fennoman Movement. This era brought the publication of what became Finland's national epic, the Kalevala, in 1835; the Finnish language achieved equal legal status with Swedish in 1892. As a Grand Duchy, Finland instituted universal suffrage in 1906, becoming the second country to do so, despite Russian efforts to restrict Finland's autonomy. The members of the four estates in the autonomous legislative assembly, the diet, represented only a small fraction of the population. Universal and equal eligibility and suffrage was introduced, irrespective of land ownership or gender. 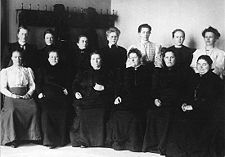 Finnish women became among the first in the world to enjoy full political rights, resulting in 19 elected women in the first modern democratic election. The 13 of 19 women elected to Parliament in 1907. The Finnish Parliament is celebrating its centenary in 2006–2007. Following the 1917 Russian Revolution, Finland declared itself independent. In 1918, the fledgling republic was divided by civil war, with the Bolshevik-leaning "reds" supported by the equally new Soviet Union, fighting the "whites," supported by Imperial Germany. The Whites ultimately won and installed a king, a puppet of the German Empire; deep bitterness between the rural peasants and urban working class and the urban and rural bourgeoisie remained. The defeat of Germany in World War I led to the disappearance of Germany's influence; Finland became a republic and elected its first president in 1919. The Finnish-Russian border was formalized, but the relationship between Finland and the Soviet Union remained tense. Fokker D.XXI planes of the Finnish Air Force during World War II. World War II brought several battles along the border with German-occupied Soviet Union. Treaties signed in 1947 and 1948 with the Soviet Union included obligations, restraints, and reparations on Finland vis-à-vis the Soviet Union as well as further Finnish territorial concessions. Finland ceded about 10 percent of its land area, 20 percent of industrial capacity and 400,000 evacuees, mainly women and children. Finland maintained its autonomy from the Soviet Union throughout the Cold War era. Establishing trade with the Western powers, such as the Great Britain, and the reparations to the Soviet Union caused Finland to transform itself from a primarily agrarian economy to an industrialized one. 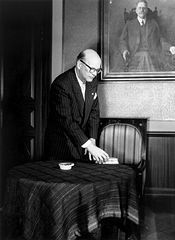 Urho Kekkonen (then Prime Minister), in 1953, who later became Finland's longest-standing President. Immediately following the Second World War, Finland lay in the grey zone between the western countries and the Soviet Union. The Finno-Soviet Pact of Friendship, Cooperation, and Mutual Assistance gave the Soviet Union some leverage in Finnish domestic politics, which was exploited. However, Finland maintained a democratic government and a market economy unlike most other countries bordering the Soviet Union. The post-war era was a period of rapid economic growth and increasing wealth and stability for Finland. In all, the war-ravaged agrarian country was transformed into a technologically advanced market economy with an extensive social welfare system. When the Soviet Union disintegrated in 1991, the bilateral trade disappeared overnight. Finland was simultaneously hit by a severe depression. This left a mass unemployment problem, but the economy survived and began growing at a high rate after the depression. 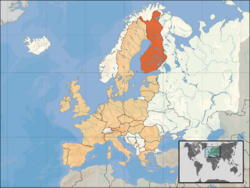 Finland joined the European Union in 1995, where it is an advocate of federalism contrary to the other Nordic countries that are predominantly supportive of confederalism. May 23, 2007 was the 100th anniversary of the first plenary session of Finland's unicameral parliament. The theme of the centenary is "The right to vote – trust in law. One hundred years of Finnish democracy." The anniversary festivities focus on the parliamentary reform of the early twentieth century and the introduction of equal and universal suffrage and full political rights for women. These reforms included the introduction of a proportional representation, open list voting system, and the right to vote and to be elected for all citizens, including women. A total of 19 female MPs were elected in the first election. On May 23, 2006, a statue was unveiled to honor the work of female MPs. 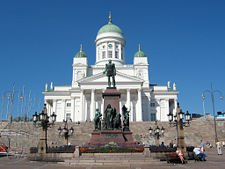 Main building of the Parliament of Finland (eduskunta) in Helsinki. Unlike its neighboring constitutional monarchies of Denmark, Norway, and Sweden, Finland is a republic with a president and parliament system. The President of Finland is responsible for foreign policy outside of the European Union. Most executive power lies in the cabinet, headed by the Prime Minister. According to the Constitution, the Parliament elects the Prime Minister, who is appointed to office by the President. Other Ministers are appointed by the President on the Prime Minister's proposal. Each minister, and the cabinet as a whole, must have the continuing confidence of the parliament and may be voted out, resign, or be replaced. The Council of State is made up of the Prime Minister and the ministers for the various departments of the central government as well as an ex-officio member, the Chancellor of Justice. 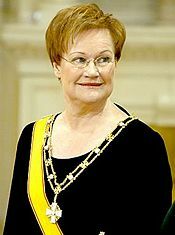 The current President is President Tarja Halonen. She began her first term of office in 2000 and was re-elected on January 29, 2006. Her current term expires in 2012. She is the eleventh President of Finland and the first woman to hold the office. The 200-member unicameral Parliament of Finland is called the Eduskunta (Finnish) or Riksdag (Swedish). It is the supreme legislative authority in Finland. Members are elected for a four-year term by direct popular vote under a system of proportional representation. The parliament may alter the Constitution, bring about the resignation of the Council of State, and override presidential vetoes. Its acts are not subject to judicial review. Legislation may be initiated by the Council of State, or a member of the Eduskunta. The judicial system is divided between courts with regular civil and criminal jurisdiction and administrative courts with responsibility for litigation between the individuals and the administrative organs of the state and the communities. Finnish law is codified and its court system consists of local courts, regional appellate courts, and the Supreme Court. The administrative branch of justice consists of administrative courts and the Supreme Administrative Court. In addition to the regular courts, there are a few special courts in certain branches of administration. There is also a High Court of Impeachment for criminal charges (for an offense in office) against the President of the Republic, the justices of the supreme courts, members of the Council of State, the Chancellor of Justice and the Ombudsman of Parliament. The constitution and its place in the judicial system are unusual in that there is no constitutional court and the supreme court does not have an explicit right to declare a law unconstitutional. In principle, the constitutionality of laws in Finland is verified by a simple vote in the parliament. Finland is divided into six administrative provinces that are further divided into 90 state local districts. The provincial authority is part of the executive branch of the national government, and has no elected officials. This system was created in 1634, and underwent few major changes until the redivision of the country into "greater provinces" in 1997. Since then, the six provinces have been: Southern Finland, Western Finland, Eastern Finland, Oulu, Lapland, and Åland. These provinces are merely administrative divisions. 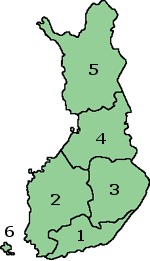 Finland has two levels of democratic government: the state, and 416 municipalities (as of January 1, 2007). The municipality is the same as a "city" level of government, except that rural municipalities are not called "cities." Since 1977, no legal or administrative distinction is made between towns, cities and other municipalities. Although a municipality must follow the laws set by the state, it makes independent decisions. Municipalities co-operate in 74 sub-regions and 20 regions. The Åland Islands enjoy a degree of autonomy. According to international treaties and Finnish laws, the regional government for Åland handles some matters that would belong to the provincial authority in Mainland Finland. The same international treaties create an official language for Åland: one must speak Swedish to own land in Åland. The Åland region has a permanent, democratically elected regional council, as a part of its autonomy. In the Kainuu region, there is a pilot project underway, with similar autonomous regional elections. 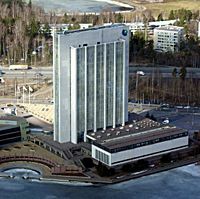 The Ministry for Foreign Affairs is responsible for Finnish foreign policy, founded on military non-alliance and neutrality. Finland furthered its integration into Europe by joining the European Union, with Sweden and Austria, in 1995. Finland's policy of neutrality is, effectively, "military non-alignment" with an emphasis on maintaining a competent independent defense; military policy is strictly self-defensive. Peacekeeping under the auspices of the United Nations is the only extra-national military responsibility Finland undertakes. Finland is not a member of NATO, but does participate in its Partnership for Peace. As a member of the Nordic Council, Finland holds good relations with its Scandinavian neighbors. 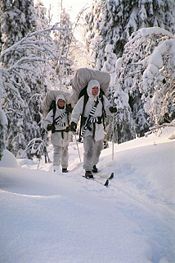 Finnish troops on skis. Most conscripts receive training for ski warfare. As a self-defensive force, Finland's military, the Finnish Defense Force, is made up of 34,700 people in uniform (standard readiness strength). All Finnish men, with some exceptions, serve for 6 to 12 months. Women can volunteer for service as well. Finland maintains a large trained reserve force of about 350,000. The defense budget accounts for roughly 1.4 percent of GDP. The Ministry of Trade and Industry is responsible for the Government's energy policy. Finland has no fossil fuel resources, but high demand for energy, both due to the cold climate and the nature of its industry. Priority has been placed on increased efficiency of use. Finland is connected to the Nordpool, the Nordic electricity market. Finland also refines imported oil to cover domestic needs and has developed widespread use of renewable energy resources, most notably wood-based, which accounts for about one-fifth of energy consumption. Nuclear power also plays an important role in Finland's energy budget. Finland started planning the introduction of nuclear power in the 1950s. In 2001, 18 percent of all electricity consumed in Finland was produced by the country's four nuclear power plants. An application to build a fifth power plant led to political controversy. On May 24, 2002, Parliament supported the application by 107 votes to 92. After the vote, the Green League resigned from the government in protest; all the other parties were divided over the nuclear issue. The fifth nuclear power station is currently under construction by the French Areva. 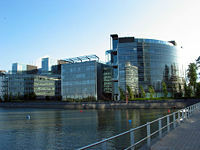 Headquarters of Nokia, the largest company in Finland. Finland has a highly industrialized, largely free-market economy with a per capita output equal to that of other western economies such as Sweden, UK, France, and Germany. Services represent the largest sector of the economy. However, with respect to foreign trade, the key economic sector is manufacturing of principally wood, metal, engineering, telecommunications and electronic products. International trade is important to the economy, with exports equalling almost one-third of GDP. Except for timber and several minerals, Finland depends on imports of raw materials, energy, and some components for manufactured goods. In 1991, Finland experienced an economic collapse leading to a severe recession caused by economic overheating, depressed foreign markets, and the dismantling of the barter system between Finland and the former Soviet Union. More than 20 percent of Finnish trade was with the Soviet Union before 1991, and in the two years following, trade practically ceased. With new debt and economic restructuring in the early 1990s, the economy stabilized. By 1995, the Finnish economy was growing again and since then the growth rate has been one of the highest of OECD countries. The national debt has been reduced to 41.1 percent (fulfilling the EU's Stability and Growth Pact requirement). Because of the country's northern climate, agricultural development is limited to maintaining self-sufficiency. Forestry, an important export earner, provides a secondary occupation for the rural population. Finland was one of the 11 countries joining the euro monetary system on January 1, 1999. The national currency markka (FIM), in use since 1860, was withdrawn and replaced by euro (EUR) in the beginning of 2002. M/S Silja Symphony on Kustaanmiekka strait. Cruises are a popular tourist attraction throughout Finland. Pictured from the Suomenlinna Sea Fortress. Tourism is an expanding industry in Finland and has become a significant aspect of its economy in recent years. In 2005, Finnish tourism grossed over US$ 8.9 billion (€6.7 billion) with a 5 percent increase from the previous year. Much of the sudden growth can be attributed to the globalization and modernization of the country as well as an increase in publicity and awareness. Over 4 million visitors came in 2005. Winter sports are a significant draw, as are summer art and music festivals. 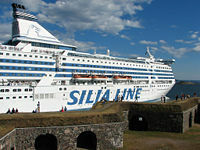 Commercial cruises between major coastal and port cities in the Baltic region, including Helsinki, Turku, Tallinn, Stockholm and Travemünde, play a significant role in the local tourism industry. Finland, in 2005, had a total main road length of 8,238 miles (13,258 km), and is mainly centered on the capital city of Helsinki. There are 48,582 miles (78,186 km) of all public roads; 31,451 miles (50,616 km) are paved. The highway network is still under development, and currently totals 406 miles (653 km). There are 3,644 miles (5,865 km) of railways in the country. Helsinki has an urban rail network, and light rail systems are currently being planned in Turku and Tampere. Finland also has a considerable number of airports and large ports. Helsinki is an optimal location for great circle airline traffic routes between Western Europe and the Far East and provides a stop-over for many international flights. Finland numbers 5,276,571 inhabitants and has an average population density of 44 inhabitants per square mile (17/km²). making it the most sparsely populated country in Europe, after Norway and Iceland. Finland's population has always been concentrated in the southern parts of the country, where the major urban areas are. The biggest and most important of those cities are the Greater Helsinki metropolitan area (including the cities of Helsinki, Vantaa, Espoo and Kauniainen), and Tampere, Turku, and Oulu. Since the late 1990s, Finland has received refugees and immigrants at a rate comparable with the other Nordic countries, although the total ethnic-minority population remains far lower in Finland: foreigners represent only 2 percent of the population. Many immigrants originate from the former Soviet Union claiming ethnic (Finnic) kinship. Finnish is in the Finno-Ugric language family and is typologically an agglutinative language. It modifies and inflects the forms of nouns, adjectives, pronouns, numerals and verbs depending on their roles in the sentence. It is likely that speakers of the Finno-Ugric language arrived in the area during the Stone Age. The largest minority languages in Finland are Swedish (5.5 percent), Russian (0.8 percent) and Estonian (0.3 percent). Swedish language has official status in Finland; other minority languages are also protected by law. Over 20 languages are now spoken in Finland by immigrant groups of significant size (at least a thousand speakers). To the north, in Lapland, the Sami, like the Finns, speak a Finno-Ugric language. Known widely in the past as Lapps, a term now considered derogatory by many Sami. The Sami live in Finland, Sweden, Norway, and Russia, totaling about 75,000 to 100,000, sharing a cultural identity. There are three Sami languages that are spoken in Finland: Northern Sami (majority), Inari Sami (300–400 people) and Skolt Sami (400 people), by about 7,000 Sami (roughly 0.13 percent of the population). The majority of Finns are proficient in the English language. The Helsinki Cathedral with the statue of Emperor Alexander II of Russia. Most Finns are members of the Evangelical Lutheran Church of Finland (82.4 percent), the official church, along with the Finnish Orthodox church, of Finland , with a minority of 1.1 percent belonging to the Finnish Orthodox Church. The remainder of the population consists of small groups (totaling 1.1 percent) of other Protestant denominations, Roman Catholics, Muslims and Jews and a growing population of unaffiliated (15.4 percent). . Church attendance is much lower than these figures suggest; most of the population hold generally secular views. After having one of the highest death rates from heart disease in the world in the 1970s, improvements in Finnish nutrition and physical exercise have paid off: Finland is now ranked as one of the healthiest countries in the world. The life expectancy is 82 years for women and 75 years for men. Jean Sibelius (1865–1957), a Finnish composer of classical music. Finland is a place rich in culture for history, tradition, and religion. There are churches and cathedrals scattered across Finland reflecting the strong Finnish Lutheran presence. There are also museums and examples of ancient architecture remaining from the Swedish Empire. Castles from that era, some converted to museums, are found in Turku, Hämeenlinna, and Savonlinna. Olavinlinna in Savonlinna hosts the annual Savonlinna Opera Festival. The city of Helsinki, on the other hand, is famous for its Grand Duchy era architecture, resembling that of imperial Saint Petersburg. Since its earliest contact with foreign peoples and monarchs, Finns have accepted influences from Western Europe (particularly Sweden and Germany) and, more recently, North America into their indigenous culture. There are very few Russian influences, with the exception of the 1.1 percent Russian Orthodox minority. The concept of Finnishness persists as a national identity and traditional characteristics and customs, despite differences among regions, including minor differences in accents and vocabulary. Minorities maintain their own cultural characteristics, such as the Sami and Swedish-speaking Finns. Many Finns are emotionally connected to the countryside and nature; urbanization is a relatively recent phenomenon. Much of the music of Finland is influenced by Karelian traditional tunes and lyrics, as represented in the Kalevala. Karelian culture is perceived as the purest expression of the Finnic myths and beliefs, reflecting Finland's position between the East and the West. Finnish folk music has undergone a roots revival in recent decades, and has become a part of popular music. The Sami of northern Finland have their own musical traditions as well. 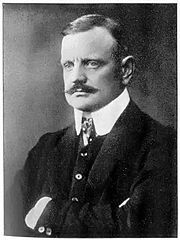 Jean Sibelius is perhaps the most well-known of Finnish classical composers. Modern Finnish popular music includes a renowned heavy metal scene, like other Nordic countries, as well as a number of prominent rock bands, jazz musicians and hip hop performers. Finland has a growing film industry with a number of famous directors such as Aki Kaurismäki, Timo Koivusalo and actors such as Mikko Leppilampi. Hollywood film director/producer Renny Harlin was born in Finland. Architects and designers Alvar Aalto, Eliel Saarinen, and Eero Saarinen have created internationally acclaimed buildings. Another fast-growing sector is the use of the Internet. According to the Ministry of Transport and Communications, Finland had more than 1.3 million Internet connections by the end of 2005, about 250 per 1,000 inhabitants. All Finnish schools and public libraries are connected to the Internet. Traditional Finnish cuisine is a combination of European, Fennoscandian and Western Russian elements. The food is generally simple, fresh, and healthy. Fish, meat, berries and root vegetables are typical ingredients; spices are not common due to their scarcity in the early days. Traditionally, Finnish food varied from region to region, most notably west to east. In coastal and lakeside villages, fish was one main feature of cooking; in the eastern and northern regions, vegetables and reindeer were more common. Official holidays in Finland are established by acts of Parliament. The official holidays can be divided into Christian and secular holidays; some of the Christian holidays have replaced holidays of pagan origin. The main Christian holidays are Christmas, Epiphany, Easter, Ascension Day, Pentecost, and All Saints Day. The secular holidays are New Year's Day, May Day, Midsummer Day, and Independence Day. In addition, all Sundays are official holidays but not marked as special holidays. The names of the Sundays follow the liturgical calendar. Retail stores are prohibited by law from doing business on Sundays, except during the summer months (May through August) and in the pre-Christmas season (November and December). 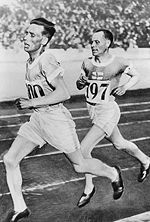 Ville Ritola (leading) and Paavo Nurmi at 1928 Summer Olympics. Sports are popular in Finland and many Finns regularly attend sporting events. Some of the most popular recreational sports include floorball, a variation on field hockey and ice hockey played indoors, Nordic walking, running, and skiing. Pesäpallo (reminiscent of baseball) is the national sport of Finland, but the most popular sports are ice hockey and Formula One. The Finnish national men's ice hockey team is considered one of the best in the world. During the past century, Finland and Sweden have been rivals, mostly in ice hockey and athletics. Football (soccer) is also very popular in Finland, though the national football team has never qualified for the FIFA World Cup or the UEFA European Football Championship Finals Tournament. Some of the most outstanding athletes from the past include Hannes Kolehmainen (1890-1966), Paavo Nurmi (1897-1973) and Ville Ritola (1896-1982), who together won 18 Olympic gold medals and 7 silver in track. They were the first of a generation of great Finnish long distance runners often named the "Flying Finns." Another long distance runner, Lasse Virén (b. 1949), won 4 Olympic gold medals in 1972 and 1976. 2003 Rank 1 of 43 countries in reading performance. ↑ Formerly a semi-presidential republic, it's now a parliamentary republic according to David Arter, First Chair of Politics at Aberdeen University, who in his "Scandinavian Politics Today" (Manchester University Press, revised 2008), quotes Jaakko Nousiainen in "From semi-presidentialism to parliamentary government" in Scandinavian Political Studies 24 (2) p95–109 as follows: "There are hardly any grounds for the epithet 'semi-presidential'." Arter's own conclusions are only slightly more nuanced: "The adoption of a new constitution on 1 March 2000 meant that Finland was no longer a case of semi-presidential government other than in the minimalist sense of a situation where a popularly elected fixed-term president exists alongside a prime minister and cabinet who are responsible to parliament (Elgie 2004: 317)." According to the Finnish Constitution, the President has no possibility to rule the government without the ministerial approval, and does not have the power to dissolve the parliament under his or her own desire. Finland is actually represented by its Prime Minister, and not by its President, in the Council of the Heads of State and Government of the European Union. ↑ Väestön ennakkotilasto 2011, elokuu (in Finnish). Statistics Finland (22 September 2011). Retrieved December 20, 2011. ↑ 3.0 3.1 3.2 3.3 Finland. International Monetary Fund. Retrieved December 20, 2011. ↑ University of Leicester. November 14, 2006. Psychologist Produces The First-ever 'World Map Of Happiness', Science Daily. Retrieved April 24, 2007. ↑ Arkistolaitos, National Archives Service, Finland. Retrieved April 23, 2007. ↑ Finland in figures, Statistics Finland. Retrieved April 23, 2007. ↑ August 24, 2004 Trends in sea level variability, Finnish Institute of Marine Research. Retrieved April 23, 2007. ↑ Prehistory, Virtual Finland (Ministry for Foreign Affairs of Finland). Retrieved April 23, 2007. ↑ History and governance, Virtual Finland (Ministry for Foreign Affairs of Finland). Retrieved April 23, 2007. ↑ Global Corruption Report 2007. Corruption and Judicial Systems, Transparency International. Retrieved April 24, 2007. ↑ Energy Consumption in 2001, Statistics Finland. Retrieved April 24, 2007. ↑ Global Competitiveness Report 2006-2007, World Economic Forum. Retrieved April 24, 2007. ↑ Population, Statitistics Finland (Finnish Language site). Retrieved April 24, 2007. ↑ February 19, 2007. Kirkon väestötilastot tarkentuneet – Suomalaisista 82,4 prosenttia kuuluu luterilaiseen kirkkoon, Evangelical Lutheran Church of Finland. (Finnish language site). Retrieved April 24, 2007. ↑ Finland in Figures, Statistics Finland. Retrieved April 24, 2007. ↑ Child poverty in perspective: An overview of child well-being in rich countries, UNICEF Innocenti Research Center. Retrieved February 14, 2007. ↑ The Global Competitiveness Report 2006-2007: Country Highlights, World Economic Forum. Retrieved April 24, 2007. ↑ Health (2004), Statistics Finland. Retrieved April 24, 2007. ↑ Fat to fit: how Finland did it, Guardian Unlimited. January 15, 2005. Retrieved April 24, 2007. ↑ Jyrki Jyrkiäinen. August 2004 The Finnish Media: outlets increase, audiences diversify, Virtual Finland (Ministry for Foreign Affairs of Finland) Retrieved April 24, 2007. ↑ Timo Poropudas. April 26, 2006. Suomalaisilla on 5,4 miljoonaa matkapuhelinliittymää, Digitoday.fi (Finnish language site). Retrieved April 24, 2007. History of Finland: Primary Documents. Euro Docs. Kostiainen, Auvo. Genocide in Soviet Karelia: Stalin's Terror and the Finns of Soviet Karelia. Genealogia. This page was last modified on 10 April 2017, at 18:05.